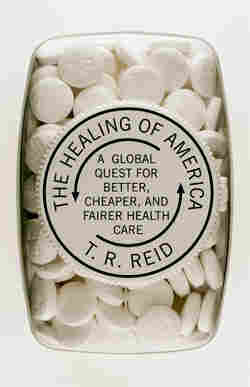 Excerpt: 'The Healing Of America' In his health care expose, T.R. Reid, a reporter for the Washington Post, reveals numerous opponents of American health care reform as liars, or at best, ill-informed. 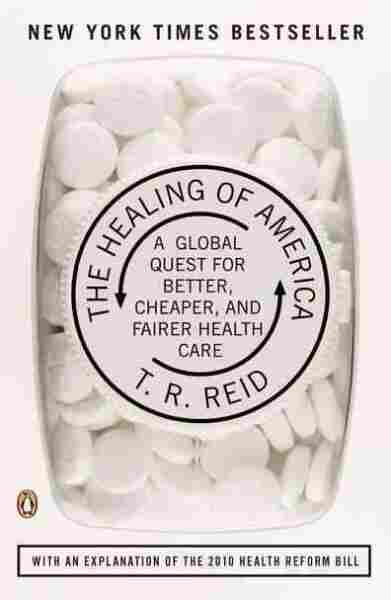 Reid discusses the benefits of overseas health care programs and tries to dispel the fearful myth of "socialized health care." Mrs. Rama came sweeping into my hospital room with the haughty grandeur of a Brahmin empress, wearing a salmon pink sari and leading a retinue of assistants, interpreters, and equipment bearers. It wasn't exactly medical equipment they were carrying, because Mrs. Rama wasn't exactly a doctor. Still, her professional services were considered an essential element of the medical regimen at India's famous Arya Vaidya Chikitsalayam, the Mayo Clinic of traditional Indian medicine. Indeed, Mrs. Rama's diagnostic work is covered by Indian medical insurance. As she set up her equipment--on a painted wooden board, she carefully arranged a collection of shells, rocks, and statuettes of Hindu gods--Mrs. Rama told me that she was connected to the clinic's Department of Yajnopathy, an ancient Indian specialty that roughly equates to astrology. Her medical role was to ascertain my place in the cosmos; in that way, she could determine whether the timing was propitious for me to be healed. Any fool could see, she explained in matter-of-fact tones, that it would be a mistake to proceed with medical treatment if the stars in heaven were aligned against me. For all her majestic self-assurance, Mrs. Rama did not immediately inspire confidence in her patient. After asking some basic questions, she shuffled the stones and statuettes around her checkerboard and launched into my diagnosis. "In the summer of 1986, you got married," she declared firmly. Well, not exactly. In the summer of 1986, my wife and I celebrated our fourteenth wedding anniversary; by then we had three kids, a dog, and a minivan. "In 1998," she went on, "you were far from home and were treated for serious illness." Well, not exactly. Our American family was, in fact, living in London in 1998; but in that whole year, I never saw a doctor. Mrs. Rama kept talking, but I stopped listening. To me, the stones and shells and statues all seemed preposterous. Still, I kept my mouth shut. If Indian medicine required yajnopathic analysis before health care could begin (and Mrs. Rama did eventually conclude that the timing was propitious for treatment), that was fine with me. I was willing to go along, in pursuit of the greater goal. For I had traveled to the Arya Vaidya clinic--it's in the state of Tamil Nadu, at the southern tip of the subcontinent, where the Bay of Bengal meets the Arabian Sea--on a kind of medical pilgrimage. I was on a global quest, searching for solutions to two different health problems, one personal and one of national dimensions. On the personal level, I was hoping to find some relief for my ailing right shoulder, which I bashed badly decades ago as a seaman, second class, in the U.S. Navy. In 1972, a navy surgeon (literally) screwed the joint back together, and that repair job worked fine for a while. Over time, though, the stainless-steel screw in my clavicle loosened; my shoulder grew increasingly painful and hard to move. By the first decade of the twenty-first century, I could no longer swing a golf club. I could barely reach up to replace a light bulb overhead or get the wineglasses from the top shelf. Yearning for surcease from sorrow, I took that bum shoulder to doctors and clinics--including Mrs. Rama's chikitsalayam--in countries around the world. The quest began at home. I went to a brilliant American orthopedist, Dr. Donald Ferlic, a specialist who had skillfully repaired another broken joint of mine a few years back. Dr. Ferlic proposed a surgical intervention that reflects precisely the high-tech ethos of contemporary American medicine. This operation--it is known as a total shoulder arthroplasty, Procedure No. 080.81 on the National Center for Health Statistics' roster of "clinical modifications"--would require the orthopedist to take a surgical saw, cut off the shoulder joint that God gave me, and replace it with a man-made contraption of silicon and titanium. This new arthroplastic joint would be hammered into my upper arm and then cemented to my clavicle. The doctor was confident that this would reduce my shoulder pain--orthopedic surgeons tend to be confident by nature--but I had serious reservations about Procedure No. 080.81. The saws and hammers and glue made the procedure sound rather drastic. It would cost tens of thousands of dollars (like most major medical procedures in the United States, the exact price was veiled in mystery). The best prognosis I could get was that the operation might or might not give me more shoulder movement. And when I asked Dr. Ferlic what could go wrong in the course of a total arthroplasty, he was completely honest. "Well, you have all the risks that go with major surgery," he answered calmly. And then he listed the risks: Disease. Paralysis. Death. With that, a certain skepticism crept into my soul about this high-tech medical intervention. I departed my American surgeon's office and took my aching shoulder to other doctors, doctors all over the globe. Over the next year or so, I had my blood pressure and temperature taken in ten different languages. I ran into a world of different diagnostic techniques, ranging from Mrs. Rama and her star charts to a diligent, studious doctor (we'll meet him in chapter 9) who told me he couldn't possibly analyze my medical condition without tasting my urine. In Taipei, an acupuncturist twirled her needles in my left knee to treat the pain in my right shoulder. The shoulder itself was examined, X-rayed, patted, poked, palpated, massaged, and manipulated in countless ways. Some of these treatments worked, more or less; as we'll see in chapter 9, Mrs. Rama's colleagues at the chikitsalayam were helpful. Others proved no help at all. This was not a major disappointment, though, because that aching shoulder was really just a secondary impetus for my medical odyssey. It would be ridiculous, after all, to go all the way to the southern tip of India--not to mention London, Paris, Berlin, Tokyo, and so on--to get treatment for a sore shoulder that isn't, frankly, all that sore. The stiffness is tolerable most of the time. I have another arm to use for changing light bulbs or getting glasses off the shelf. I don't have a golf swing anymore, but even when I could swing a club I was a rotten golfer. So the shoulder was not my top priority. Rather, the primary goal of my travels was to find a solution to a much bigger medical problem. It's a national problem--a national scandal, really--that is undermining the physical and fiscal health of every American. With help from many scholars and the Kaiser Family Foundation, I traveled the world searching for a prescription to fix our country's seriously ailing health care system. As Nikki White's experience demonstrates, it's fundamentally a moral problem: We've created a health care system that leaves millions of our fellow citizens out in the cold. Beyond the issue of coverage, however, the United States also performs below other wealthy countries in matters of cost, quality, and choice. Most Americans can remember when our politicians used to boast--and we used to believe--that the United States had "the finest health care system in the world." Today, any U.S. politician who dared to make that claim--it was last heard in a State of the Union address in 2002--would be hooted out of the room. Americans generally recognize now that our nation's health care system has become excessively expensive, ineffective, and unjust. Among the world's developed nations, the United States stands at or near the bottom in most important rankings of access to and quality of medical care. In 2000, when a Harvard Medical School professor working at the World Health Organization developed a complicated formula to rate the quality and fairness of national health care systems around the world, the richest nation on earth ranked thirty-seventh. That placed us just behind Dominica and Costa Rica, and just ahead of Slovenia and Cuba. France came in first. The one area where the United States unquestionably leads the world is in spending. Even countries with considerably older populations than ours, with more need for medical attention, spend much less than we do. Japan has the oldest population in the world, and the Japanese go to the doctor more than anybody--about fourteen office visits per year, compared with five for the average American. And yet Japan spends about $3,000 per person on health care each year; we burn through $7,000 per person. There's nothing particularly wrong with spending a lot of money on something important, as long as you get a decent return for what you spend. It's certainly not wasteful to spend money for effective medical treatment. If a dentist who was about to drill a tooth offered her patient a choice between listening to pleasant music for free to lessen the pain, or a shot of Novocain for $50, most people would pay for the shot and would probably get their money's worth. And there's nothing wrong with paying more for better performance. Those fifty-two-inch high-definition plasma televisions that people hang on the family room wall these days cost five times what a top-of-the-line set would have cost ten years ago, but buyers are willing to shell out the extra money because the enhanced viewing quality is worth the price. When it comes to medical care, though, Americans are shelling out the big bucks without getting what we pay for. As we'll see shortly, the quality of medical care that Americans buy is often inferior to the treatment people get in other countries. And patients know it. Surveys show that Americans who see a doctor tend to be less satisfied with their treatment than Britons, Italians, Germans, Canadians, or the Japanese--even though we pay the doctor much more than they do. You don't need an advanced degree in yajnopathy to recognize that the stars are aligned and the timing is propitious for the United States to establish a new national health care system. As Americans voted in the 2008 election, only 18 percent told the pollsters that the U.S. health care system was working well. Even American doctors, who generally do just fine, thank you, in financial terms, are unhappy with the ridiculously cumbersome and unjust system that has built up around them. And those Americans who want change in our system--which is to say, almost all Americans--are not willing to settle for minor tinkering or small-scale adjustments. Rather, 79 percent told the pollsters they want to see either "fundamental changes" or "a complete overhaul." The thesis of this book is that we can bring about fundamental change by borrowing ideas from foreign models of health care. For me, that conclusion stems from personal experience. I've worked overseas for years as a foreign correspondent; our family has lived on three continents, and we've used the health care systems in other wealthy countries with satisfaction. But many Americans intensely dislike the idea that we might learn useful policy ideas from other countries, particularly in medicine. The leaders of the health care industry and the medical profession, not to mention the political establishment, have a single, all-purpose response they fall back on whenever somebody suggests that the United States might usefully study foreign health care systems: "But it's socialized medicine!" This is supposed to end the argument. The contention is that the United States, with its commitment to free markets and low taxes, could never rely on big-government socialism the way other countries do. Americans have learned in school that the private sector can handle things better and more efficiently than government ever could. In U.S. policy debates, the term "socialized medicine" has been a powerful political weapon--even though nobody can quite define what it means. The term was popularized by a public relations firm working for the American Medical Association in 1947 to disparage President Truman's proposal for a national health care system. It was a label, at the dawn of the cold war, meant to suggest that anybody advocating universal access to health care must be a communist. And the phrase has retained its political power for six decades. Excerpted from Healing of America by T.R. Reid. Published with permission from The Penguin Press. Copyright T.R. Reid 2009. All rights reserved.